My recommendation for this week is a famous and very much appreciated, but neglected treasure of the famous team Michael Powell and Emeric Pressburger, that was also supervised by producers Alexander Korda and David O. Selznick. 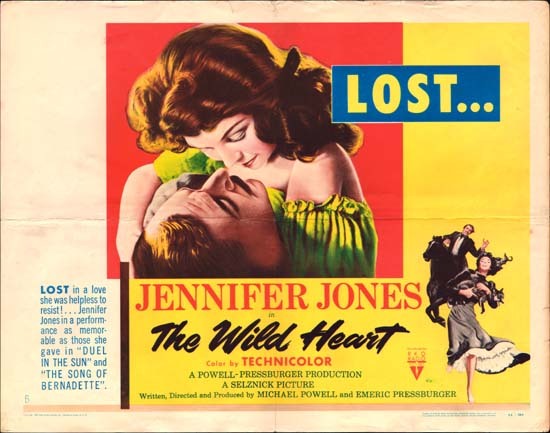 The leading role was given to Jennifer Jones, the wife of Selznick. She reminds me here of Vivien Leigh’s appearance and role as Scarlett O’Hara in “Gone With The Wind”, and the rest of the characters resemble other GWTW characters, as well. I would mention here David Farrar as John Reddin, who looked and acted almost exactly like Clark Gable’s Rhett Butler in GWTW, but also Cyril Cusack as Edward Marston, who reminded me of Leslie Howard’s Ashley Wilkes. Of course, the story is different. It is the screen version of the homonymous novel by Mary Webb. The film was recently restored at its full length, after being cut by David O. Selznick in the 1950s. The star of the picture is obviously the charming and talented Jennifer Jones, who is much less known nowadays. “Gone to Earth” was named by British cinematographer Christopher Challis “one of the most beautiful films ever to be shot of the English countryside”. You will certainly enjoy the film very much, especially because of the colours, the picturesque settings, the direction, and the actors’ performances. A superb P&P production, an unforgettable piece of British artistry of the seventh art.